To some, the state of the UK's public toilets are a source of national shame and even a curb on freedom. But an international conference under way in Belfast could be the first step towards their rehabilitation. If as some claim, a nation can truly be judged by its public toilets, then where does that leave the UK? Critics say they are neglected, dirty, unsafe and dwindling in numbers, which makes them a subject as whinge-worthy as the weather. For them, this is where community life and a civilised society meets anti-social behaviour and embarrassment. But the tide could be turning. The World Toilet Summit in Belfast this week hopes to press governments from around the globe into action, and British campaigners hope the momentum will continue when they meet ministers in October. It appears there is much to do. Two thirds of 2,000 adults recently polled by the National Consumer Council said they were disgusted by the state of public toilets. "It's affecting people's quality of life everywhere," says Richard Chisnall, director of the British Toilet Association (BTA), who is attending the summit. "People are very angry out there. We're supposed to be a developed country, yet many High Street stores have to wash down their doorways to remove the urine." Local councils have a discretionary responsibility for providing public toilets but many have closed them down, blaming costs, vandalism and cottaging by gay men. Councils are not allowed to charge for providing urinals so some toilets have been leased to private firms who can demand a fee. A survey by the BTA suggests 20% of the UK's toilets have closed in the past five years. "Many need to be closed on health and safety grounds," says Mr Chisnall. "We've got serious issues related to public health and MRSA, which has already surfaced in leisure centres and I'm sure it's lurking in public toilets." Tourist boards get more complaints about toilets than anything else, he says. Most people are prepared to pay for clean toilets but, he says, the onus is on ministers to make toilet provision statutory. "The only way it's going to change is if the government says to providers of all types 'This has got to happen and we must do something about it. If they won't say to local authorities 'Thou shalt provide' then they could at least say 'Thou must develop a provision strategy.'" A spokeswoman for the Office of the Deputy Prime Minister, which oversees local councils, said the government expects local authorities to act as "effective community leaders, listening to the views of local people and providing services which meet their needs". That's not enough because this is limiting people's freedoms, says Clara Greed, professor of inclusive urban planning at the University of the West of England, who is calling for statutory provision. "We talk about the 'bladder leash' because people are tethered by how far from home they can go and how long they can go for, due to the lack of public toilets. "This is especially bad for the elderly and the disabled but everyone needs to go every few hours. It also particularly affects women because men have twice as many facilities." It doesn't help that the issue, because of its subject, is not always taken seriously, adds Ms Greed. In some areas the closures have provoked outrage and been reversed. Twenty-six toilets in Shepway, Kent, were re-opened this year after a 21,000-strong petition. Janet Holben, of the Sandgate Society, which aims to preserve the character of the seaside village, says feelings ran very high. "Quite a few people said they would not visit again if there was no public toilet. And among residents, if you take your family on to the beach, you need a public loo." But there are models of good practice which other councils can follow. Westminster City Council only has 30 permanent public toilets for the millions of people working or visiting, but it installs street urinals at night. And top prize goes to East Lothian, where 10 years ago the decision was taken to make their toilets a source of pride, after research suggested it was tourists' top priority. 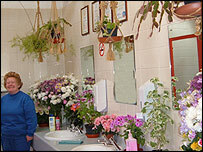 Full-time attendants adorn seven of the 12 toilet buildings with flowers and seasonal decorations at Christmas, Halloween and Valentine's Day. They all have baby-changing facilities, wheelchair access and even a visitors' book to sign. There is no charge; it costs the council £120,000 a year. "Staff showed a willingness to compete against each other," says Jill Mackay of East Lothian Council. "They went out and negotiated with local flower shops to get flowers and potted plants to decorate. "A lot of people are blown away by the array of fresh flowers and the cleanliness, particularly Americans who say they've never seen anything like it. Europeans say they wish there were more like it." And local people take visitors there to show them off, she says. I get so mad when I have to take my six-year-old daughter who is profoundly disabled due to Rett syndrome out and about. When I ask for a place to change her I'm invariably directed to a baby change (she weighs 24kg!) or the ubiquitous "disabled" toilet. Grab rails, space for a wheelchair etc all so that the "disabled" (ie. not able to use their legs but everything else functioning fine!) person can get themselves onto the toilet. If you are the carer of a profoundly disabled person all this presents you with is a (filthy) floor on which to grovel about whilst you change a nappy. Has anyone noticed that public toilets abound in West Wales? And yes, they are reasonably clean and well maintained. How do they manage it if we can't seem to? Our toilets in Northampton are very good, complete with flowers! Having used a hole in the ground in Uganda anything better seems luxurious. I'm pretty disgusted by the state of our public lavvies. In my day (and I'm getting on a bit now) people had a bit of respect for others and didn't leave public toilets in a vile mess after they used them. Not to mention the druggers and other unsavoury types that hang around them. Even if I'm bursting I'd much rather wait till I get home! I had to pay 20p to use a public toilet in Oswestry -- it was clean, tidy and had music playing.. Well worth the money. Compare those to the one near Somerfields in Ludlow -- they are disgraceful!! I think the example set by the loos in the King's Cross Station is one to follow. For 20p, you get a clean, well-attended, functioning toilet with soap, hand dryers, working locks and good lighting. I would happily pay 20p to have these facilities all over London and the rest of the UK. Free would be better, but let's face it - it's worth 20p!! The other facilities I see around the city are too disgusting to contemplate. I wouldn't use them even if they were free. I think clean toilets are a basic necessity for any civilised nation. I agree that if they were clean and pleasant we would not complain too much about having to pay up to 50p in central London. It is infuriating having to pay in some of London's major rail terminals only to find them in an appalling state. On a recent visit to Brighton sea front for a VW Car Show, I found that the public toilets by the Hover Craft port were outstanding. Very clean, fresh, lots of them, the attendants were friendly & best of all they ware free! With such a high standard of toilet I was expecting to pay - and I would have paid! The toilets in my home town of Bournemouth are also nice, clean & friendly but there needs to be more them, with all the visitors we have, there can be long queues in the summer. Let me get this straight, Westminster City Council's model of good practice is in installing street urinals at night. That's a great amount of help for women who need to use a toilet late at night. Yet again women (if not stuck in lengthy queues) are left to cross their legs while men are taken care of. One of the first things I noticed when I moved to Japan were the state of public toilets... they are immaculate, even if the ones at stations are the squat toilets and not the conventional 'western' ones. Still, they are clean and the hand dryers actually blow out hot air at a speed at which your hands dry after just a few seconds. Who would ever want to leave this haven of cleanliness and politeness is a mystery to me. On the main North-South (A4) motorway in Belgium, there is a sign which if I recall correctly states "Toilets 38 km". I once stopped there with my 3 year old daughter in desperate need, only to find them closed. Of course, since they were closed, it was evident that the public had used the nearest available public place, sorry grass. The City Of Bath has just closed most of its public conveniences down. Outside the prestigious Roman Baths there are, at all times of year, dozens, sometimes hundreds of tourists milling around. Goodness knows what they think of this city with almost no toilets. I would have thought that it shows a clear sense of civic pride for any town or city to have first class toilet facilities. If they will spend time and effort entering 'Britain in Bloom' why won't they just provide a loo or two to show their pride? Anyone who has been to any Greek Island understands that compared to them our system is 5*. The problem we have here is no one appreciates the hard work of our toilet attendants. May be money should be invested into educating people on how to use a toilet properly. Unfortunately this seems to have gone out the window and very little people consider other users. We love complaining about them if they are not right, but at the same time we love abusing them - especially us men. We use them as a canvas for our graffiti and as a paper for our (somewhat dirty) thoughts or advertisements for certain 'services rendered'. We also use them to do drugs in them and don't forget the time-honoured practice of 'cottaging', or gay men meeting each other for a quickie. Of course, the minute there is a problem, the councils close the loos instead of dealing directly with the problem. All this in what is supposed to be a 'civilised' society. I think public loos should be franchised out as small businesses and run like laundrettes. I am English but now live in the USA. As long as I can remember British public toilets have been an absolute disgrace. That's if you could find one anyway. Here in America they're everywhere. Open 24 hours, well maintained and I've never seen a single one vandalised. I would like to point out that we have better public toilets than some. For example go to France, it's hard to believe that they're ever cleaned. Or in North Africa, the toilet is just a hole in the ground. Sure public toilets aren't as good as your home toilet but they're adequate. It's hardly surprising so many people urinate and defecate in public, when very often no public lavatories are provided. At London Bridge railway station, for example, the public have access to only a single lavatory unit on the main concourse, for which it is not uncommon to queue for 15 minutes or longer. A nightmare when you have small children desperate to go. I feel pretty disgusted by the majority of public toilets. During the day when in town centres I try to use the toilets in department stores and in the evenings or suburban areas use the nearest pub. Council run toilets are regularly cleaned but with a strong pungent solvent based cleaner which reeks. I used to not drink at all during the day so that I could go all day without having to go to the toilet. I have to say that I live in Clevedon near Bristol in North Somerset and we have two sets of public toilets that would put most to shame! The first set is in the town centre and they are always clean and nice to use, but even better, along the seafront there is a set of public loos that I have never seen the likes of!! The lady who runs them puts so much time and attention into them, there are pretty curtains and dried flowers made into sprigs along with lace that adorn all the toilets, there is music playing and I have never seen toilets so clean! I think it's very important to have access to clean and safe public toilets, particularly if you have young children. Currently I dread having to take them to the loo when we're out because there's never any paper, lights don't work, they're dirty and often the floor is soaking wet - we'd be better off going in the bushes! I would pay 20p for a nice clean loo. I don't expect cut flowers etc, but toilet roll, hot water and soap isn't too much to ask for is it? I visited Dubai last year and was amazed at the standard of cleanliness in public areas, inc. public toilets. These people seemed obsessed with being clean, which is a good thing in my eyes and a mentality we should adopt. There are no public toilets in Preston city centre - if you need to go you have to pop into a cafe or pub. The local authorities should ensure there are public facilities in all city or town centres - it's basic hygiene and health requirement. Having just returned from living in Switzerland for a year I am dismayed by the good old British Loo. Perhaps it also has something to do with how people also treat them. Most Swiss toilets were pristeen, clean and fresh and smelt as fresh as a daisy. They even supplied loo brushes to enable users to leave the loo in good order for the next visitor. In NZ many towns have taken up the 'toilet challenge' after research showed that visitors remember most fondly the towns where the facilities are good. In my home town of New Plymouth our 'Ladies Restroom' in the centre of the shopping district was going to be removed until public outcry led to a re-think by the council. These features are essential for visitors and locals alike - after all, we all need to go sometime! I regularly shop at my local Tescos and Sainsburys and find at both the toilets are a disgrace. Bearing in mind these are foods shops, the fact that Tescos - Cowley has had taps that do not function properly - meaning most users fail to wash their hands altogether, these have been like it for over a year now. I only hope the staff have better facilities. If you would like clean public toilets everywhere, come to Luxembourg. We set a world standard here. None of them is free - 50 cents (about 32p) is the norm, but it's worth it. As the mother of a recently potty trained toddler I have become increasingly aware of the need to know where public facilities are located and quickly! The cry of 'I need a wee' results in a panic-stricken search for a toilet. Frequently I am disgusted by what I have found available, but have been left with little choice but to let my child go to the toilet there. For the sake of all those other parents out there too, can we please have more clean, well lit, well ventilated toilets, at least one sink at child level, or with a built in step, and plenty of soap! Oh yes, and not forgetting, plenty of sign posts so we can run to them in time! What really is disgusting is the fact that public toilets are now areas of congregation for junkies and smackheads. In Bangor there are even boxes behind the toilets provided by the cleaners for the addicts to dispose of their hypodermic needles. The lack of standards for public sanitation is even more shocking than the rate of teen pregnancies. In this day and age there should be no need to complain about a decent place to pay a call. Have used the public loos near the main market in Tbilisi, I think we have pretty good public facilities on the whole but still think they should be free, cleaned, 'policed' and open 247 -at least this would stop people using the streets after dark! I have to say the public toilets near my office in Glasgow must be an exception to the rule. I always find them extremely clean and the attendants are always up for a chat. I haven't found similar elsewhere but these attendants do such a good job they deserve more recognition than they get. Do you object to paying to use a public toilet?